...only it does. For so long, A has only lived his life day in and day out. Because, duh, he inhabits a different body everyday; he really doesn't have a choice. Because his experiences are technically not his own (although he's in control, he's made a conscious effort not to deviate from how his hosts would usually go about their day), he's learned to appreciate life through the eyes of his many hosts. A has never had a reason to want more than a day. A has learned to accept the things the way they were. Until Rhiannon. What makes a person, a person? Is it our body? Is it our thoughts? Is it our experiences and how we handle them? Our emotions? Our soul? Our essence? What is our essence? (I guess we could all answer that last part but that would take an incredible amount of time and study and general thinking) I'm pretty sure we discussed this in my college philosophy class but I'm only questioning it because A is a person but there's so many complexities that makes it hard to imagine. In the story, Rhiannon would find it hard to interact with A whenever A would show up in a different body. However it was evident that she felt more comfortable around boys with somewhat pleasing appearances. We could chalk it up to Rhiannon's preferences but it sorta makes you wonder- who or what part of a person do we really fall in love with? 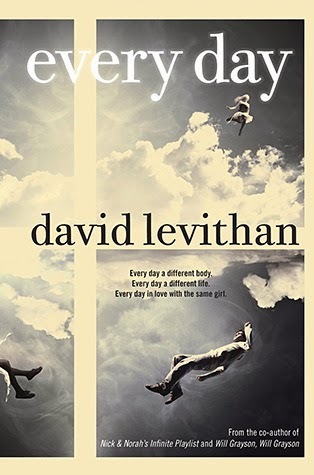 David Levithan's breathtaking writing. This is the first time I've read anything of his. I can confidently say that his work is something every reader should try at least once. It is quite an experience. The rareness of a story like this. Every Day isn't just about love. There's so much more underneath A and Rhiannon's story to ponder on. It's not often you find a book that can effortlessly move you and entertain you as well. Please read this book. Buy it and then read it. I have nothing else to say. I'm so glad you love this book! I suffered from emotional breakdown for weeks after reading this. And I loved it just the same way you did. it's so complicated and absolutely amazing. I bought this book a long time ago, but still haven't read it. The idea of someone being in a different body sounds really intiguing, but also a bit weird. I hope I have time to read it soon!